As interesting and sometimes even amusing as it is to look back in time, as investors we get paid for looking forward and anticipating what may come. In this respect there’s a few existing trends and themes that will remain front of mind for me and will be key to keep on your radar in 2019. Following is a selection of the key charts and indicators we will be watching in the new year. The themes span inflation/deflation, monetary policy, commodities, China, emerging markets, corporate bonds, global equities, asset allocation, and the global economy. In other words, all the issues and topics that most active asset allocators should be thinking about. I'll be covering these topics in more detail in the coming weeks on the blog so stay tuned. Overall, the theme of “transitions” I think captures a lot of the major moving parts: a transition for central banks from suppressors to sources of volatility, rotation across assets and markets, and a transition stage in the business/market cycle. Risk is clearly elevated, but as the charts show; so too is opportunity. That all said, here's the charts! Best wishes and best of luck for 2019. 1. 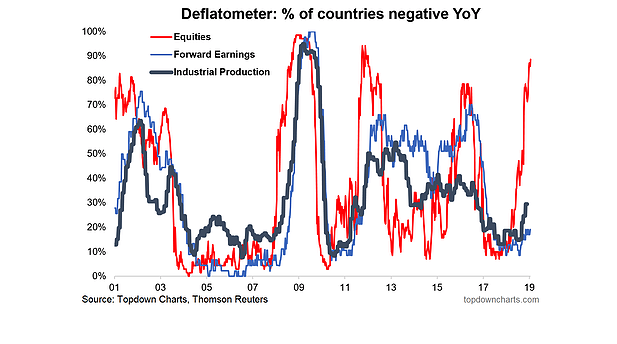 Deflation Risk: as I write, over 80% of world equity markets are in “deflation” (price negative YoY%), the risk here is that we see the black and blue lines turn up (proportion of countries seeing forward earnings and industrial production contracting on an annual basis), and if they do it will probably leave us all feeling a little black and blue, because when it comes to economic deflation, what we’re really talking about is the risk of a global economic recession. Keep this chart front of mind and top of your radar this year. 2. 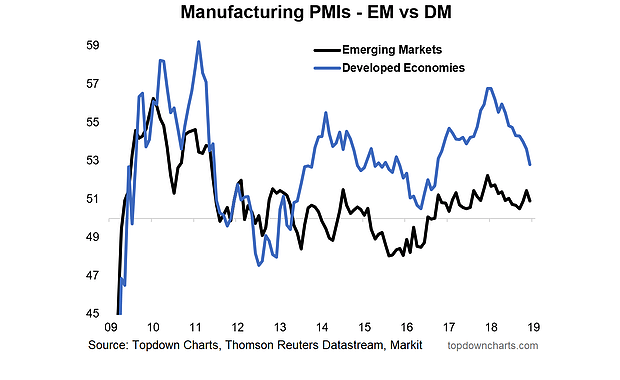 Manufacturing PMIs: down with DM, up with EM? It’s early days, but we’ve been seeing some stabilization in EM economic data (and softening across DM). Given the growing size and influence of EM economies this could be a key chart in determining how the previous chart plays out. 3. 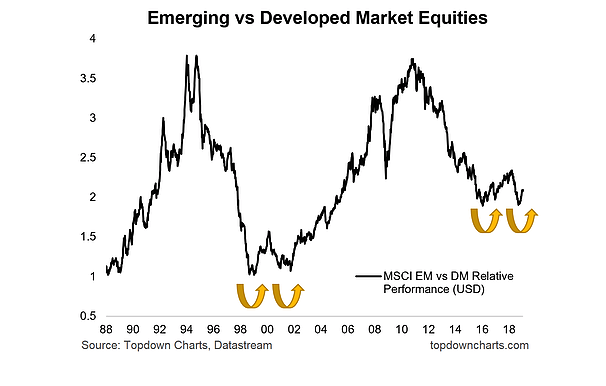 EM vs DM – Equities: this one also ties in closely with the previous chart, because this emergent economic divergence is among the many factors (including valuation) which I think will help EM equities comfortably outperform vs DM in coming years. 4. 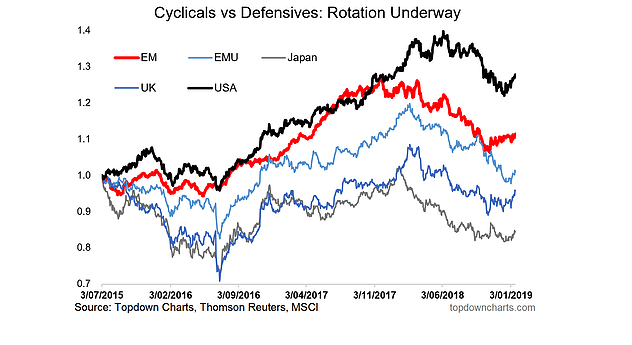 Global cyclicals vs defensives – a key theme in 2018 with rotation well underway. But the key one here (EM again!) is the red line and the nascent rebound: watch closely for follow-through. Since initially publishing this chart in the end of year report we've actually started to see the other regions begin to turn up too (...just like how EM rolled over first). 5. 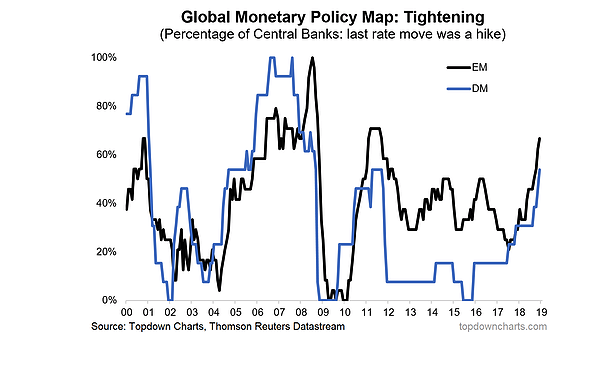 More and more global central banks are shifting into tightening mode. My guess is we’ll see more of the same here and more of monetary policy being a source (vs suppressor) of volatility. 6. One impact of monetary policy tightening is that cash becomes incrementally more attractive (as an income generating asset) beyond its core role of capital preservation. 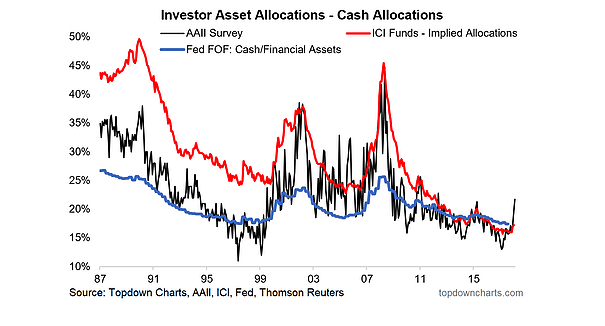 Look for cash allocations to rise from record lows (as indeed, they have already started to do so). 7. 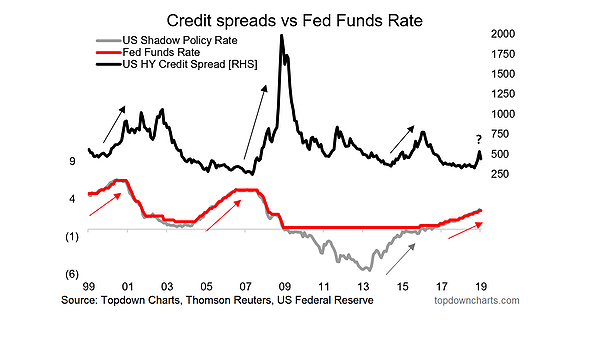 Higher cash rates may cause issues for those who opted to push risk for income: US high yield credit is in the final innings; anticipate wider spreads ahead. 8. In the wake of the global equity market correction it’s becoming easier and easier to find a bargain. Valuations have already reset to some of the previous major market lows. 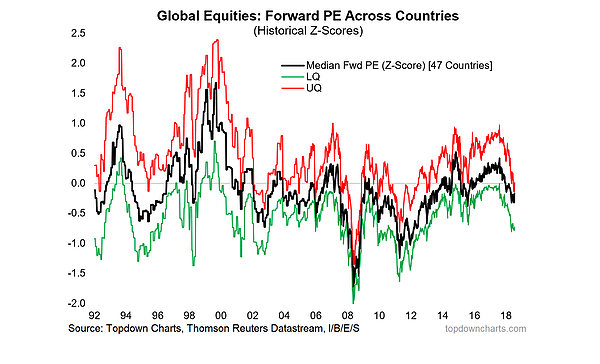 While global equities could get cheaper yet, the probability is increasingly in favor of long term investors at these levels. 9. Beset by numerous headwinds and cross-currents last year, commodities ended 2018 looking un-loved and undervalued. As with the previous chart, there’s always room to go lower, but as long as the global economy avoids recession and if China/EM do ultimately stabilize and improve the case for commodities starts to look very good. 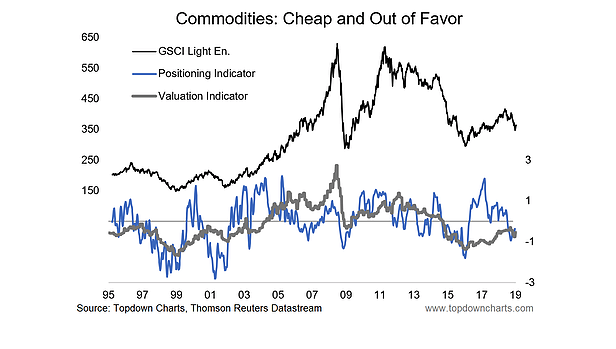 And it’s often that you see commodities tend to do well later in the cycle. As the window starts to close for US dollar strength, that could be the final element to fall into place for commodities (and EM). 10. 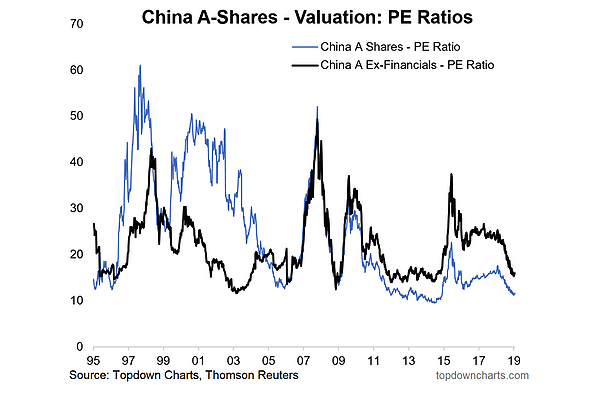 Last but not least is China again (our China stimulus chart was number 10 last year, and it remains very important), this time China A-shares in particular. A lot went wrong for China last year, and in my mind that simply sets the stage for things to go at least less wrong, if not right for China this year. Trump has helped make China A-share valuations great again (cheap again). All that’s required now is a catalyst and I can see multiple candidates.